CEOs Take on POTUS: What's the board's role? After President Trump spoke about the Charlottesville protests this weekend, many people across the country felt he didn't go far enough to condemn the right-wing hate groups that participated. 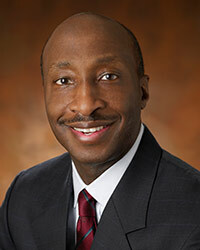 Merck CEO and chairman Ken Frazier, was one of those people and, as a result, announced via Twitter he was leaving Trump’s Manufacturing Council. "America's leaders must honor our fundamental values by clearly rejecting expressions of hatred, bigotry and group supremacy, which run counter to the American ideal that all people are created equal. As CEO of Merck and as a matter of personal conscience, I feel a responsibility to take a stand against intolerance and extremism." In the end, Trump dissolved three business panels, including the one that Frazier was on. But it begs the question, what role should the board play when it comes to chief executives making social statements, especially when their words have an impact in the Oval Office? These very public moves can impact a company's reputation, and potentially the bottom line, both positively and negatively. "Certainly CEOs are feeling a stronger need to speak," says Patricia Harned, chief executve officer of the Ethics & Compliance Initiative, about executives taking social stands publicly. There has to be an element of trust by the board in the person who's leading a company, she stresses. But, Harned adds, "if a CEO is feeling it's important to step into some of the harder areas on behalf of the company they are generally clearing that with someone. Good leaders hold themselves accountable to their boards." In the case of Merck, the CEO did reach out to the board, according to a New York Times article Tuesday. Frazier emailed Leslie A. Brun, a board member, on Sunday "to seek his input before making his decision. Brun said he was supportive, and that he felt Frazier’s background, in some part, informed the action he chose to take," states the piece. But are forays into social issues like these by corporate leaders the best move? "A CEO’s priority is to lead and build their enterprise," maintains Betsy Atkins, CEO of Baja Corporation, and director at Cognizant, Home Depot Supply, Schneider Electric, Volvo Cars and the SAP Advisory Board. "The recent kerfuffle over Trump's manufacturing panel demonstrates the downside of this mission drift from the priority of leading the company." "Unless the company’s 'brand ethos' is rooted in a particular social cause such as Whole Foods, Starbucks, Patagonia/Timberland where for example sustainability is part of the brand ethos," she says. Social views, she continues, should be kept private. Expressing personal, social views can backfire." Indeed, taking sides in social debates can be a dicey thing. Take Walmart's CEO Doug McMillon who publicly criticized Trump following his statements on the protests. "As we watched the events and the response from President Trump over the weekend, we too felt that he missed a critical opportunity to help bring our country together by unequivocally rejecting the appalling actions of white supremacists. His remarks today were a step in the right direction and we need that clarity and consistency in the future." McMillon's stand brought out calls for a Walmart boycott on social media. "Walmart lectures our President Trump on race issues after an organized leftist birddogging stunt. Time to #BoycottWalmart." On social media, as in life, it's difficult to make everyone happy.